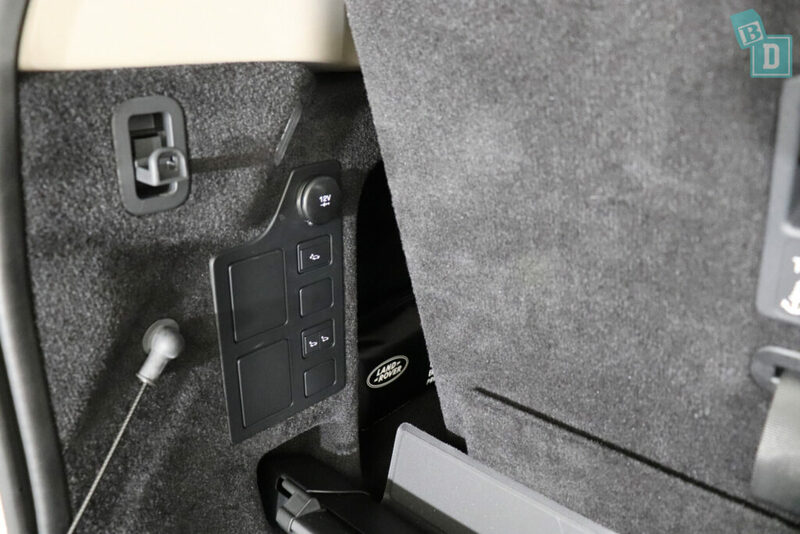 Five top tethers and four ISOFix, the Land Rover Discovery will not leave your family disco-pointed! I was offered what is apparently referred to as the Toorak tractor! Or the Chelsea tractor in the UK! Apart from being renowned for being AMAZING off-road, the Land Rover Discovery SE is perhaps better known as a school drop-off vehicle. 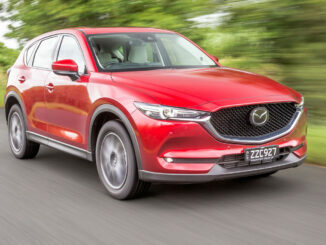 So I was keen to find out why it's so popular and put it through our BabyDrive testing! Well, let's just start with the obvious! This is one of the few seven-seaters I've tested that actually has five top tether anchorages and four sets of ISOFix points! So it's a seven-seater that can actually seat seven!! Woop Woop!! 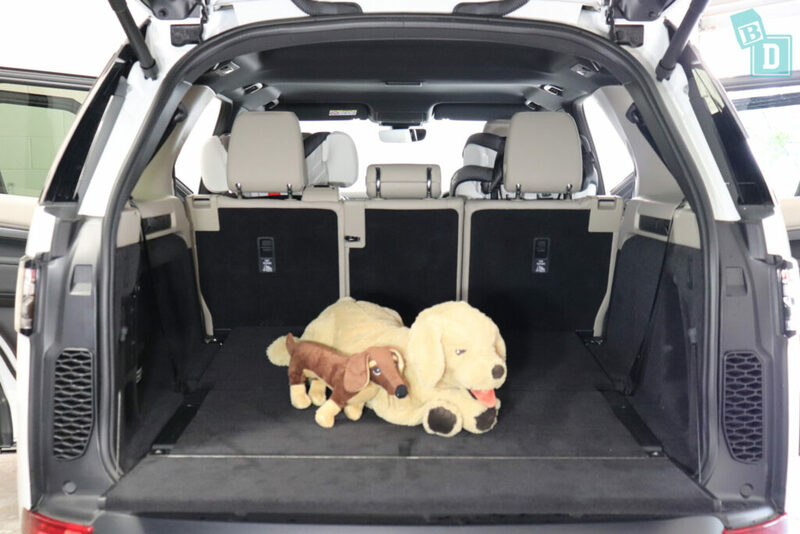 I could install five child seats in the Discovery: three forward-facing seats fitted across the second row, which was great, and another two fitted in the third-row. I could sit between two child seats in the second row and I'm 162cm. 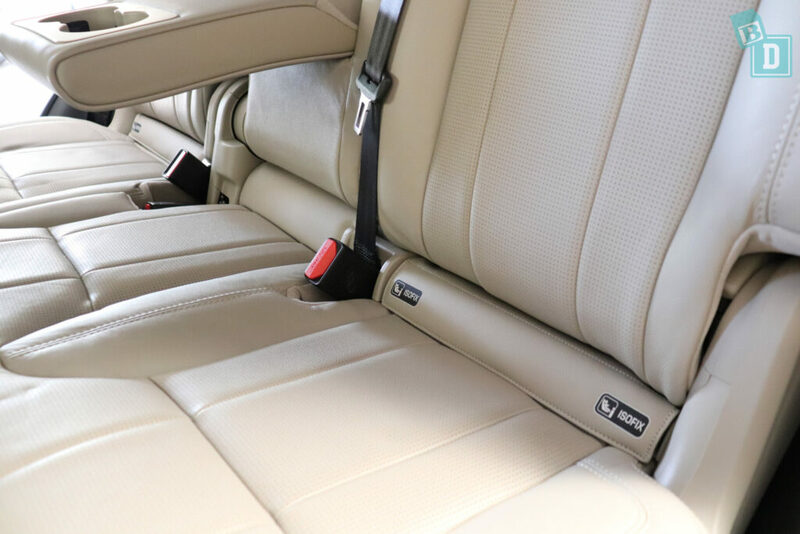 Accessing the third-row seats means you do have to uninstall at least one child seat in order to bring the second-row seatback forward and climb through. I suppose you could leave the central position empty and bring the seat-back forward so the kids climb through. If you don't have the cream leather upholstery of the one I tested!! Legroom in the Discovery we found was good but not the best. 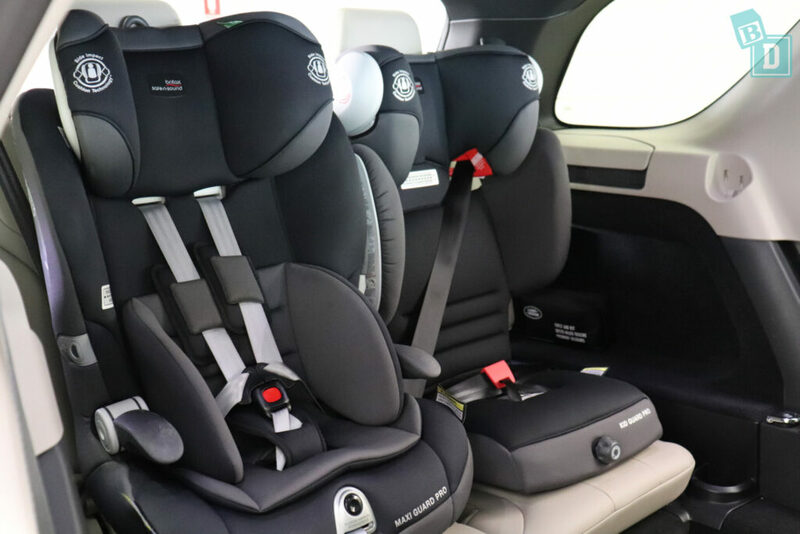 With a rear-facing child seat in the second row, a 182cm passenger can sit in front and a same-sized passenger can just about go at the back as well. They have plenty of kick room and headroom but not lots of knee room in the third row. Storage inside the cabin is very good; the third row has excellent storage, USBs and usable sized cup holders. The second row has two 12V sockets, the door bins and cup holders are thoughtfully sized and double map pockets and wells mean there are plenty of crevices for kids to tuck things into!! 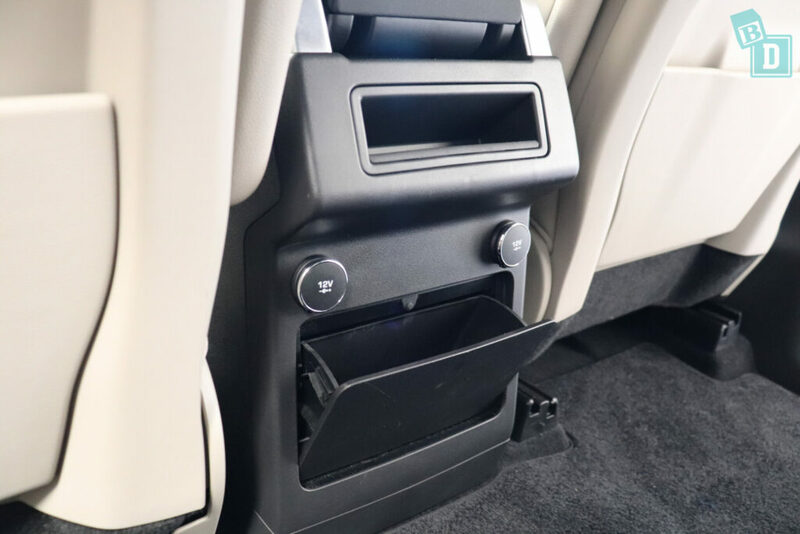 In the front, the central console houses practical cup holders, a large storage box and phone tray as well as plenty of 12V and USB points. And then there's the double glove box, glasses case and practical front door bins! In the boot the storage is VERY minimal when using all seven seats. Especially with the retractable roller blind stowed creating an uneven boot floor. There is however an electric flap that folds up to keep the contents in place. When only using five seats the boot space is fantastic and you could carry a large dog around in the back. I found eighteen shopping bags fitted or all types of stroller fitted in the boot, with good amounts of shopping bags beside them. 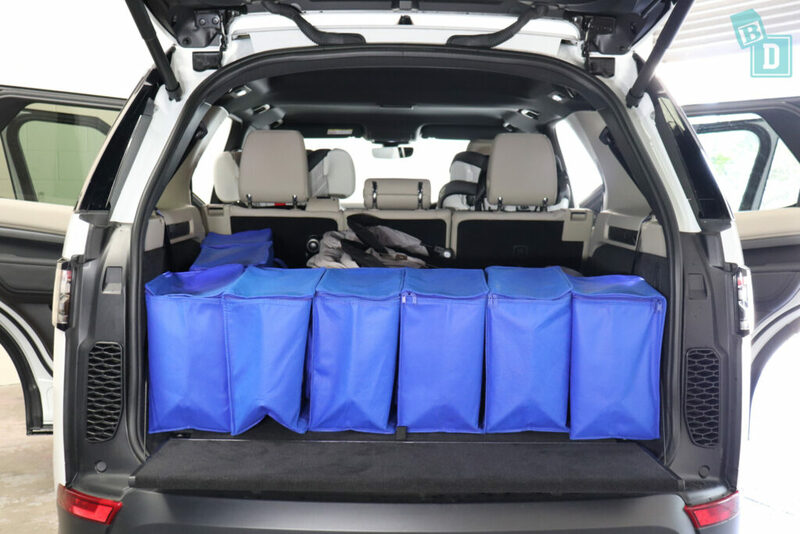 One of my favourite features about the Discovery is that you can raise and lower the height of the car, making loading and unloading the boot easier. I also found this useful when driving under my low garage door. My second favourite feature is the child lock button on the driver's door, it locks both the doors and windows so you don't need to worry about little passengers in the back fiddling with them while you are driving. There is also a REALLY good seatbelt removal display in the driver's display screen, which lights up red or green to tell you exactly who has and hasn't got their seatbelt fastened in all three rows! Although I found the media system outdated in the Discovery and without Apple CarPlay and Android Auto, the camera image is very clear and very good. You can also turn the parking sensor volume up and down using the volume controls on the steering wheel, which is excellent! 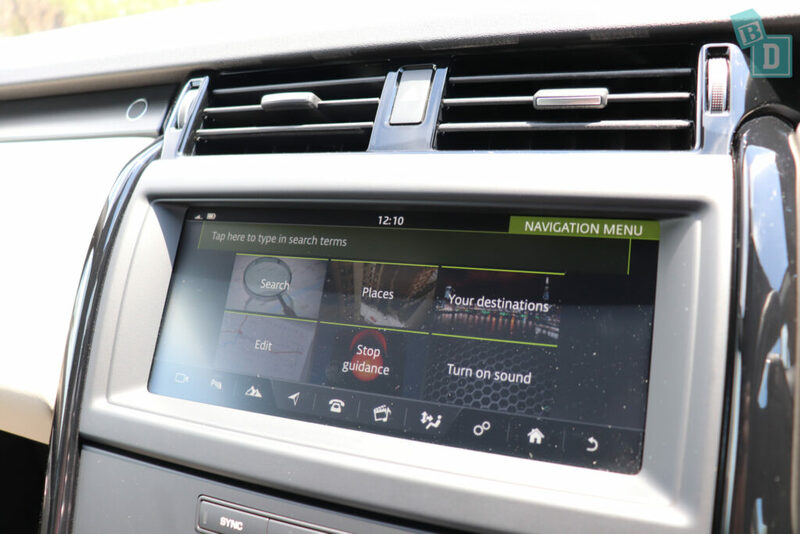 Using the in-built sat nav you can mute the navigation voice volume easily with a button in the nav menu. Which I found really simple and easy to do when driving. 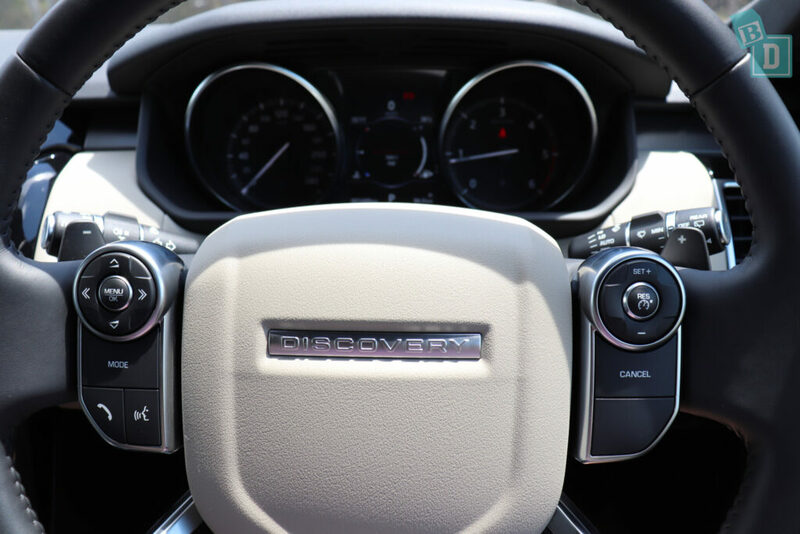 The Discovery was a smooth and quiet car to drive, it felt very sturdy and solid on the road. I got extremely lost on a drive one day and ended up on dirt roads and the Land Rover was really enjoyable and surprisingly came into its own a bit! If you only ever drive yours around town then I recommend taking it off-road for a bit of a spin!! When you have five child seats installed in the back, visibility is compromised especially out of the back window as you really can't see much at all. The excellent camera quality and different camera angles helped with this when maneuvering and parking around town. 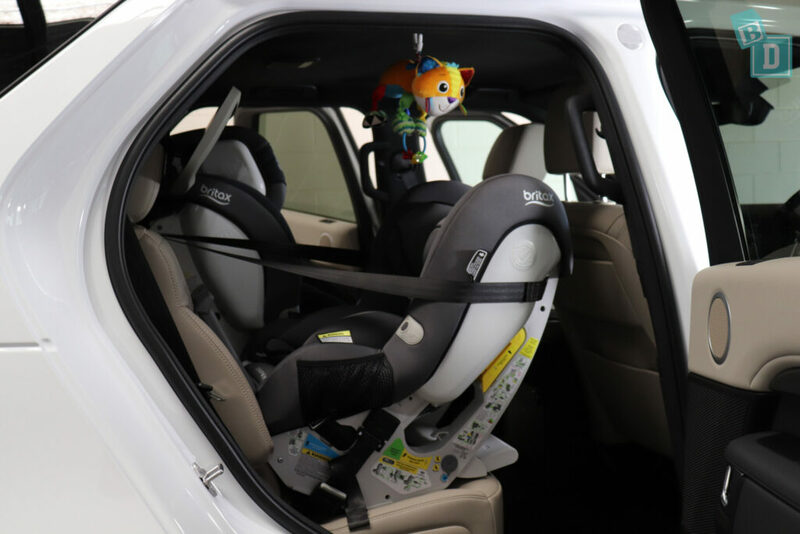 Overall I found the Land Rover Discovery to be a practical and enjoyable BabyDrive, which I imagine is why they are so popular for school drop off! 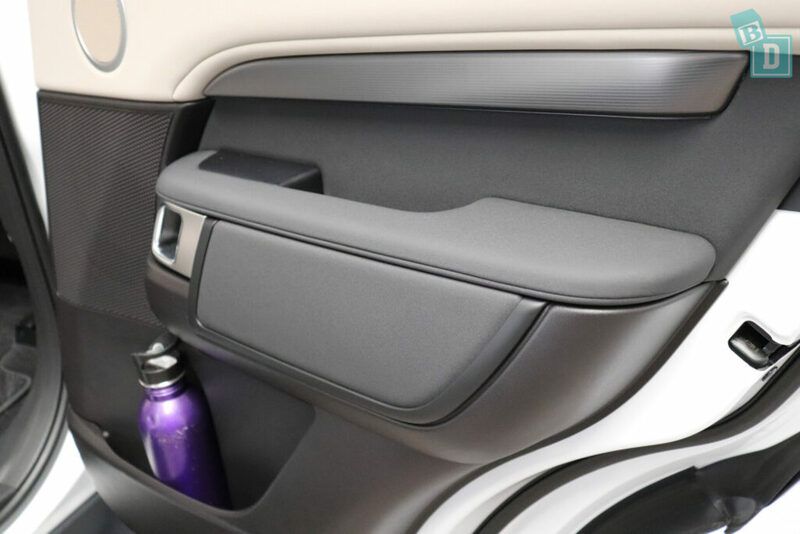 The storage features and charging points throughout the car are very well thought out and the look and feel of the car is very nice too. The perforated cream leather interior would not be my choice for a family car and I was rather paranoid about my sultana loving daughter for the whole week but it escaped unscathed!! It is a weigh up between five-seater with exceptional boot space and using all three rows of seats and not really any boot space at all! While keeping in mind that accessing the third-row seats with three child seats in the second row does mean un-installing a child seat or two! 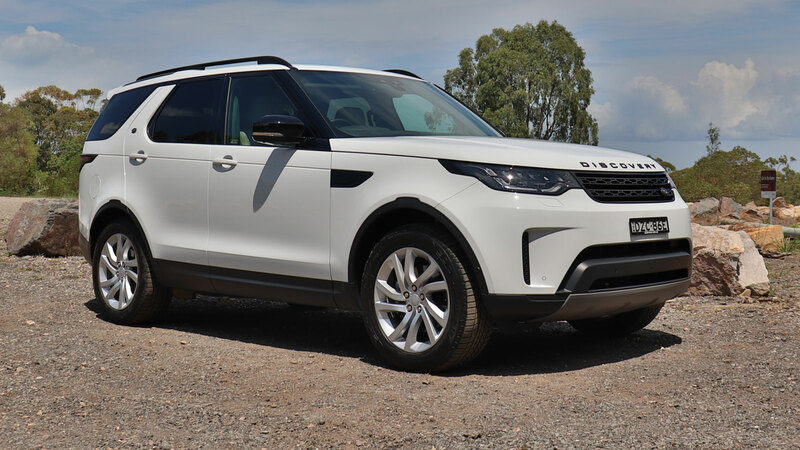 The Land Rover Discovery scored a five-star ANCAP safety rating in 2017 and comes with six airbags as standard. Both front passengers get front and side chest airbags and side head curtain airbags extend to all three rows of passengers. 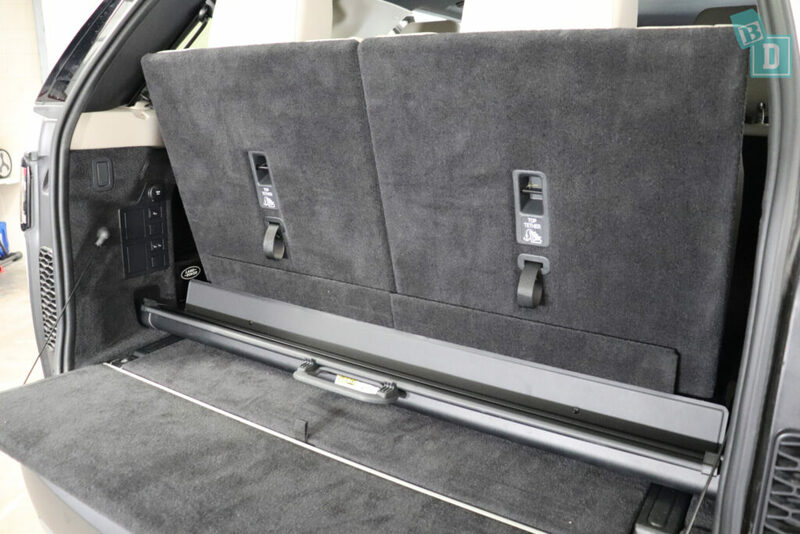 The boot of the Land Rover Discovery SE is TINY when you are using all seven seats and with the retractable roller blind stowed in position, you are left with not much usable space and an uneven surface to put things on. I managed to fit three shopping bags in the boot but no strollers would fit! The Discovery does have a handy extra flap at the back that folds up and down electronically. I found this helped to keep things in place in the boot and could easily reach over it to access anything I needed. Another great boot access feature of the Discovery is you can raise and lower the height of the car using buttons on the left side of the boot or in the central console. 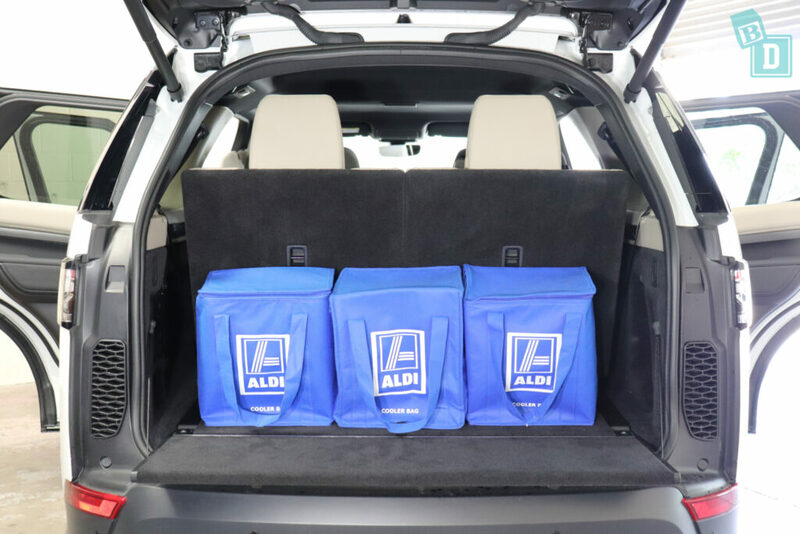 I really liked this feature because it meant I could lower the height of the car to be more accessible for my height, 162cm, when I was loading and unloading the boot and also when parking it in our garage I could lower the height of the vehicle to drive it in! There is a bag hook on either side of the boot and a 12V socket on the left. 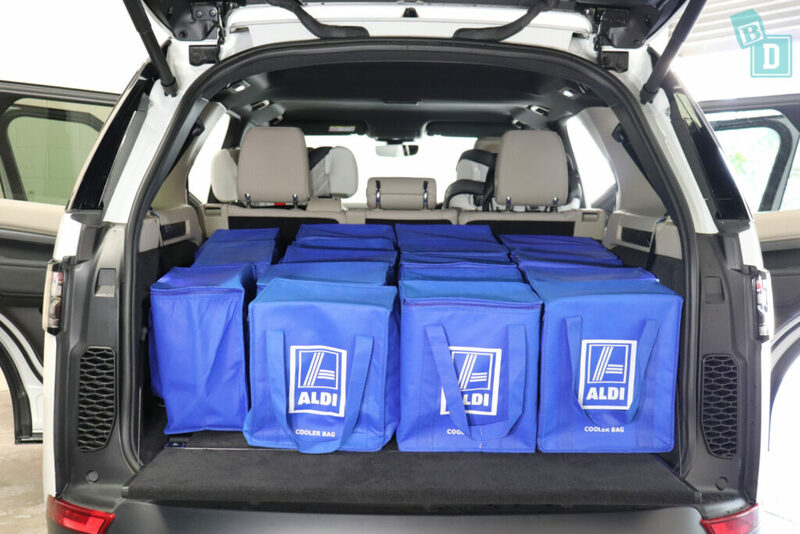 When only using five seats the boot space is enormous and you could easily do an emergency nappy change or transport a large dog in the back! 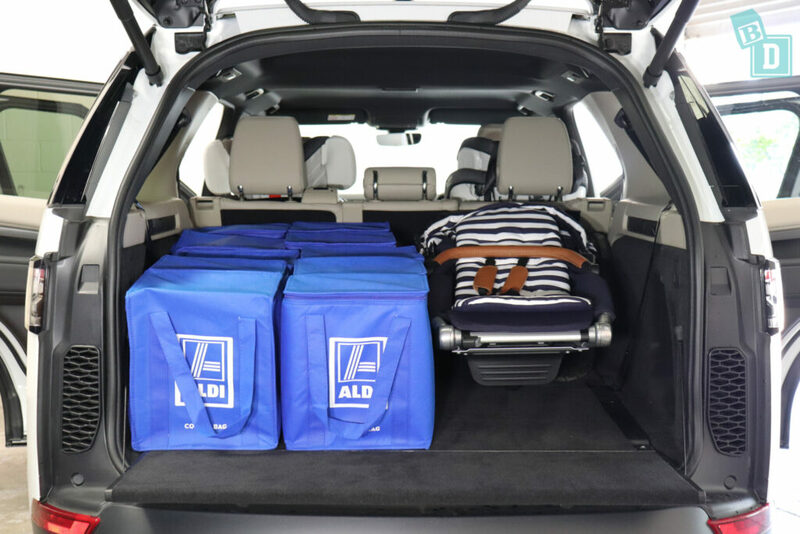 With the boot of the Land Rover Discovery SE empty, I could fit eighteen shopping bags in it. 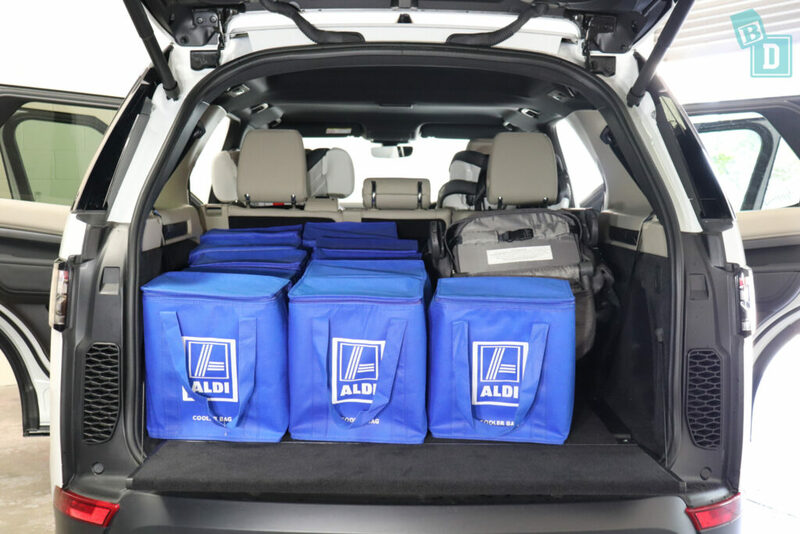 The Mountain Buggy Duet fit in the boot with eight shopping bags in alongside it. The Britax Flexx tandem stroller fitted with eleven shopping bags beside it. The Mountain Buggy Urban Jungle single stroller fitted with ten shopping bags in alongside it. The Mountain Buggy Nano compact stroller fitted laying down with thirteen shopping bags around it. 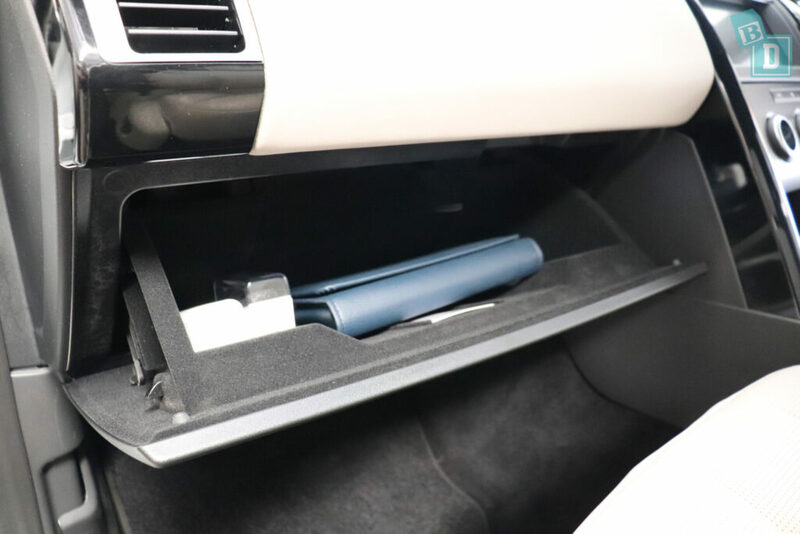 Storage in the cabin of the Discovery SE is extremely good. 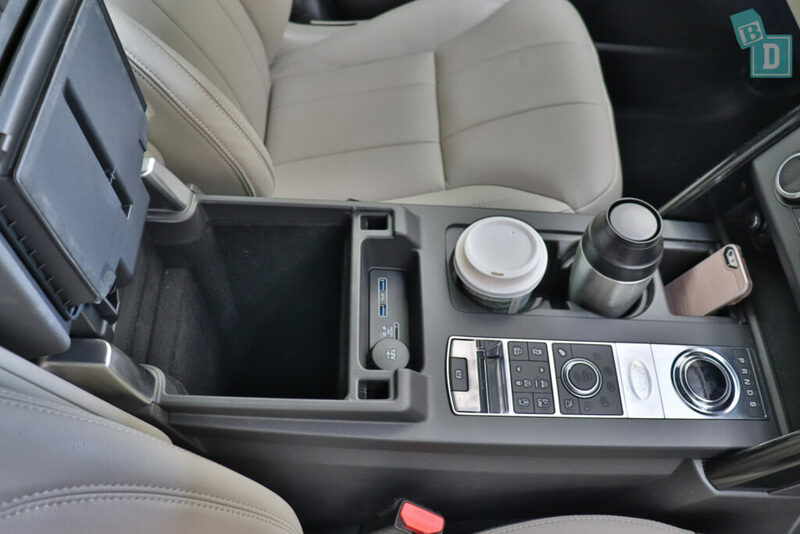 There are two cup holders in the central console, and they were a good size for travel or disposable coffee cups. There is also an extra little storage well in front of them that I used for my phone. There is a large, lined, central console storage box which contains two USBs and a 12V socket. The lid doubles as your armrest and has a tray inside the top of it too. 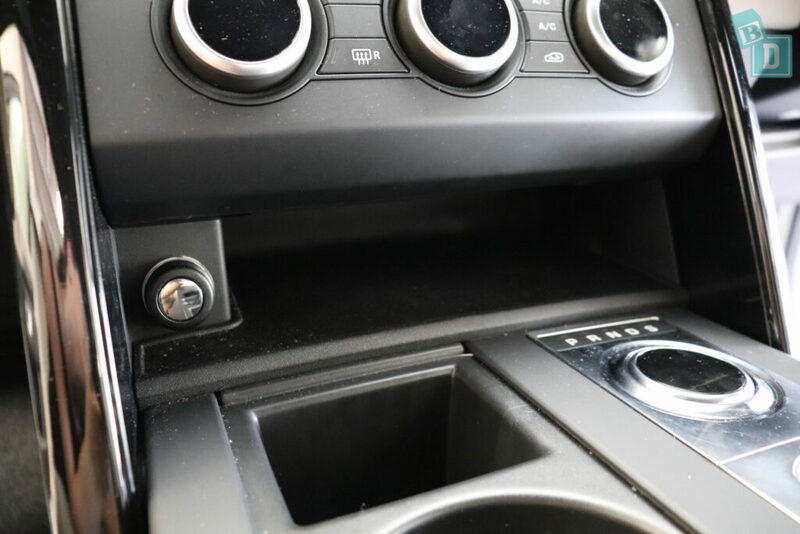 In front of the gear selector dial is a storage area with another 12V socket, but I found my phone really slid around in there so kept it in the square holder instead. There is a lined glasses case in the ceiling and both front visors have lit vanity mirrors in them. 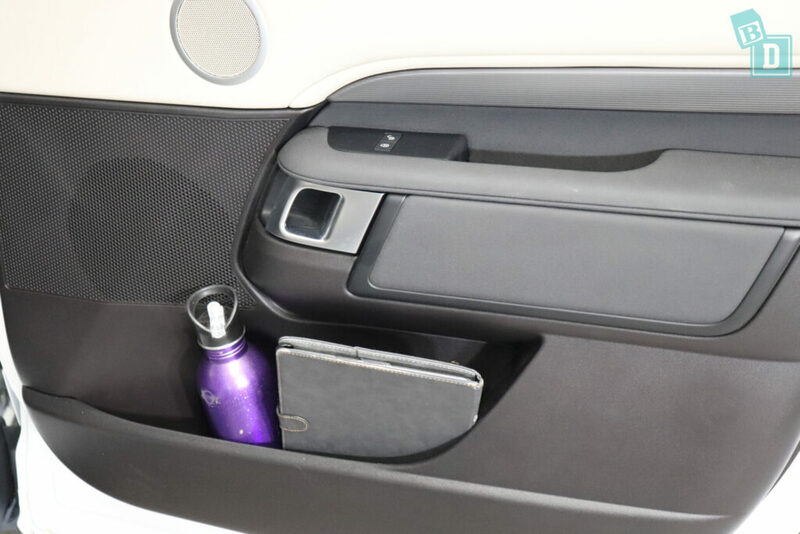 The door pockets in the front are large enough to hold a large refillable water bottle and an iPad fitted in there too. There are two glove boxes in the Discovery, they are both nicely lined. The one in the usual position would hold my wallet with the manual. The second one is above in the dashboard and my wallet would fit in there too, but not the iPad. 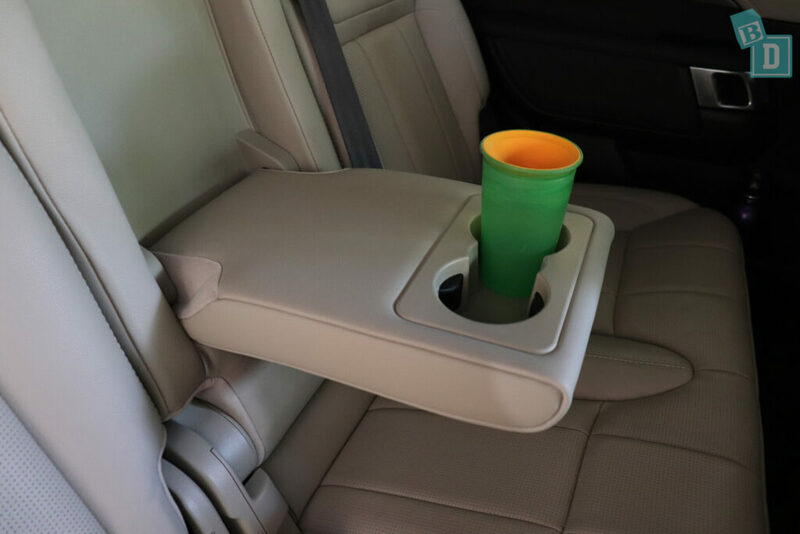 In the second row, the passengers have a fold-down armrest in the central seatback with two cup holders in it, they are a good size for a reusable and disposable coffee cup fit in them or my daughter's WOW sippy cup too. In the back of both front seats are two map pockets, The bottom one would hold but not conceal and iPad and be warned, the top one is a good hiding place for toddler sultanas and snacks!! There are a couple of little extra storage cubbies in the back of the central console that our little girl filled up with her “treasures” gathered from every walk we did while we had the Discovery! There are also two 12V sockets there too. 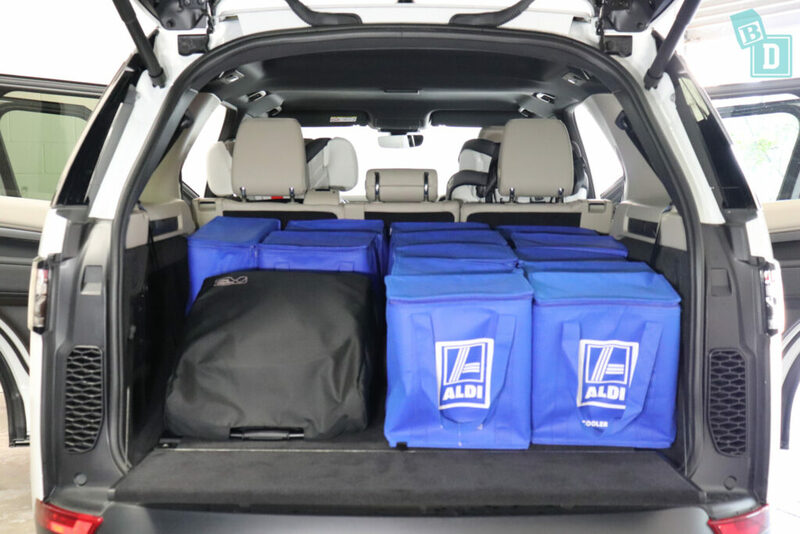 The rear door bins are similar to the fronts and will hold a large refillable water bottle and have the storage wells in the handles, which are a great BabyDrive feature. I find them really useful for popping whatever my daughter has in her hands in while I buckle her up, or to put the car keys in. 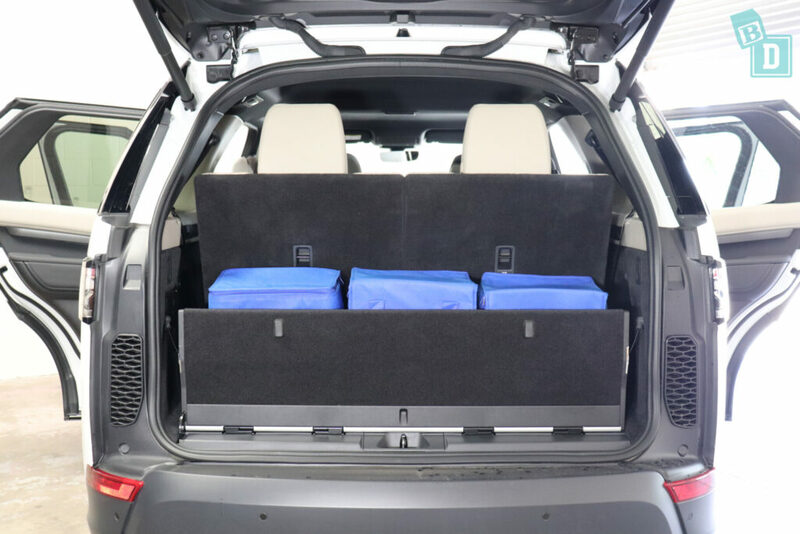 The excellent storage continues into the third-row, where passengers get a great lidded storage box on both sides that even has a USB charge point in it! There is also a cup holder on both sides around ankle height that was good for a reusable or disposable coffee cup. 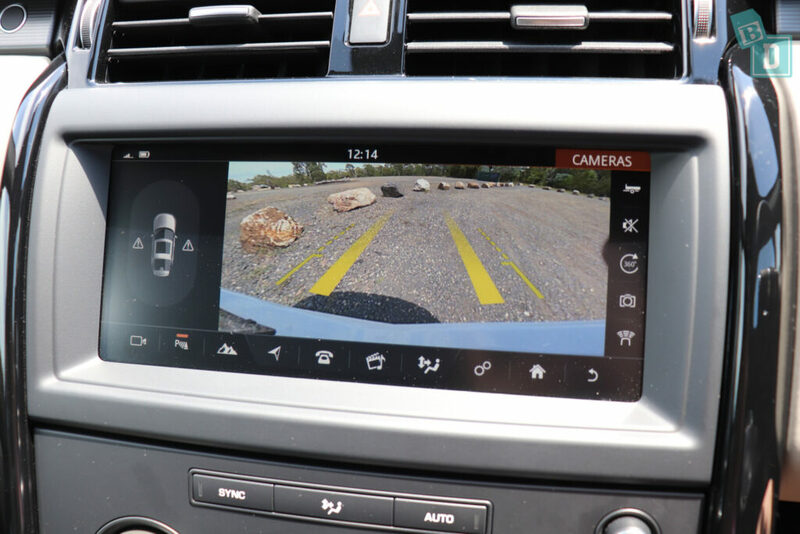 The reversing camera image is extremely crisp and clear in the Discovery and really made reversing and maneuvering easy. There are multiple camera angles you can view from as well. The parking sensors in the Land Rover Discovery are very BabyDrive friendly! There is a speaker icon on the right of the screen you can touch to minimise the sensor sound or you can use the volume controls on the steering wheel to turn their volume up and down, which is fantastic! The is a panel down in the central console that is home to the auto engine cut out switch, so you can turn it off here. I didn't find the switch between engine on and off too jarring in the Discovery so I actually left it on for the week. I find this function really disturbing for sleeping babies, you have just got your baby to sleep in the car and you stop at lights and the engine turns off sometimes they will stay asleep but when the engine shudders to a start again it shakes baby awake and all your efforts are ruined!! Even coming to a stop at lights with the engine running can be enough to wake a sleeping child so turning the engine off and on again will definitely do it! I have driven routes I know have roundabouts rather than lights just to avoid coming to a stop for any length of time!! 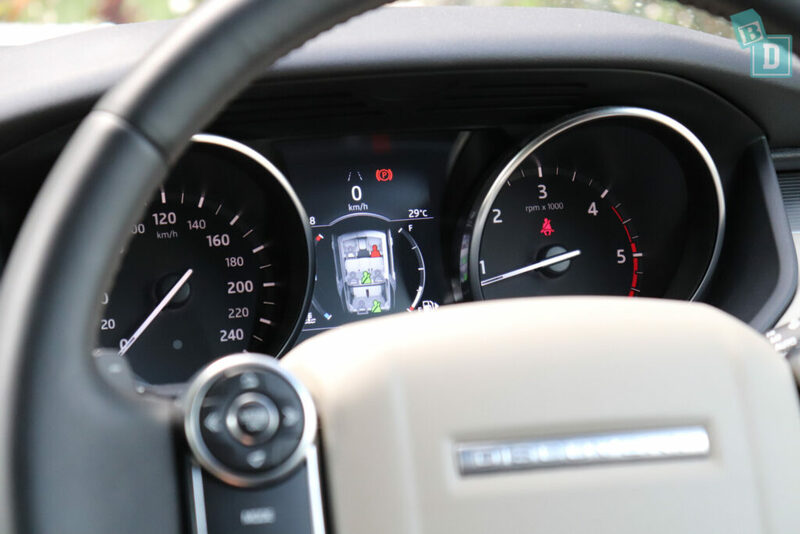 The lane departure warning in the Discovery is a vibration in the steering wheel and no beeping, which is really good so it won't disturb any other passengers. You can turn it on and off with a button by your right knee. The indicators in the Discovery have quite a soft sound so I didn’t find they affected my daughter while she was sleeping. 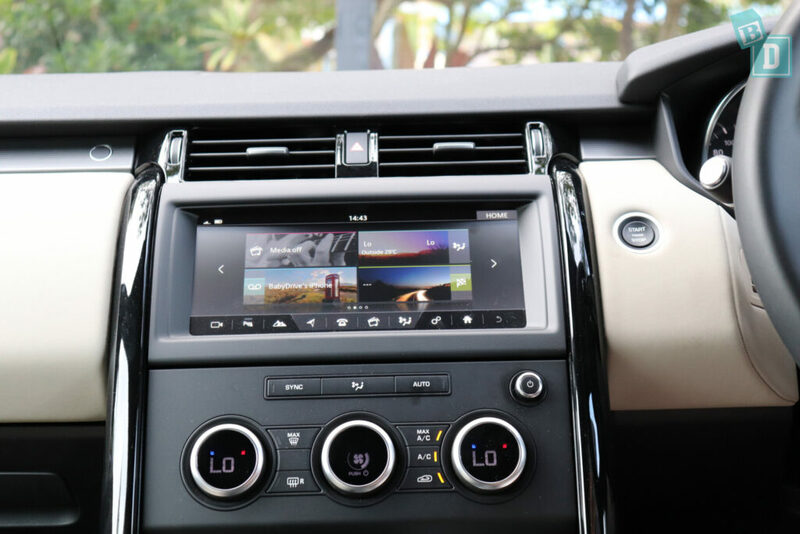 The media system in the Discovery has some surprisingly old fashioned graphics and the system feels outdated, it has no Apple CarPlay or Android Auto and I would have expected a more seamless transition from office or home to the car with technology for a brand of this level. I found the in-built sat-nav was not as simple as I'd hope for getting the location plugged in but, once I could get it going to a location, the sat nav voice was easy to mute with a big button in the sat-nav menu which was great! 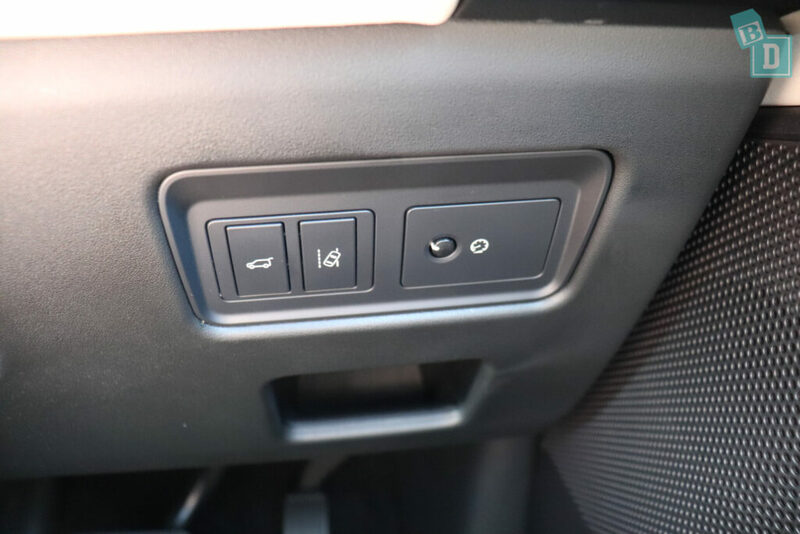 One of my favourite features is a fantastic child lock button on the driver's door that with a single press will lock both the doors and windows so no little hands can fiddle with them while you are driving! There is also a display on your driver display telling if they are locked or not. My second favourite feature is the seatbelt removal graphic in the display in front of your steering wheel which shows you exactly which passengers have their seatbelts plugged in or not. 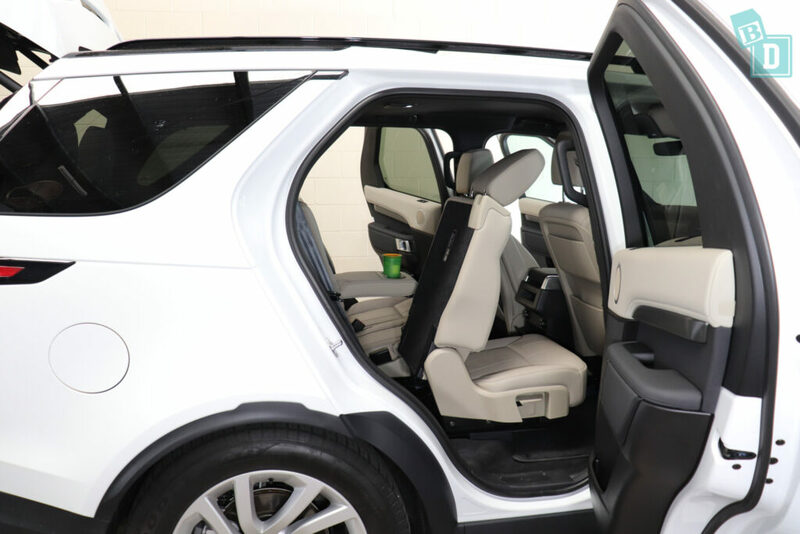 The windows in the Discovery are quite noisy to open and close, which could be baby waking in volume, the doors, however, are nice and quiet to close. The Discovery makes a rather annoying chiming sound when you open the door with the engine running and brings up a warning on the dash that the ignition is still on. It is not a shrill sound but loud enough to wake a sleeping baby for sure! This is one of those held-hostage cars!! Road and engine noise are very good in the Discovery, it is a solid, robust feeling vehicle that is smooth and quiet. The Land Rover Discovery SE is a seven-seater SUV with FIVE top tether anchorages!! Woop Woop!!! Yes, you read that right! 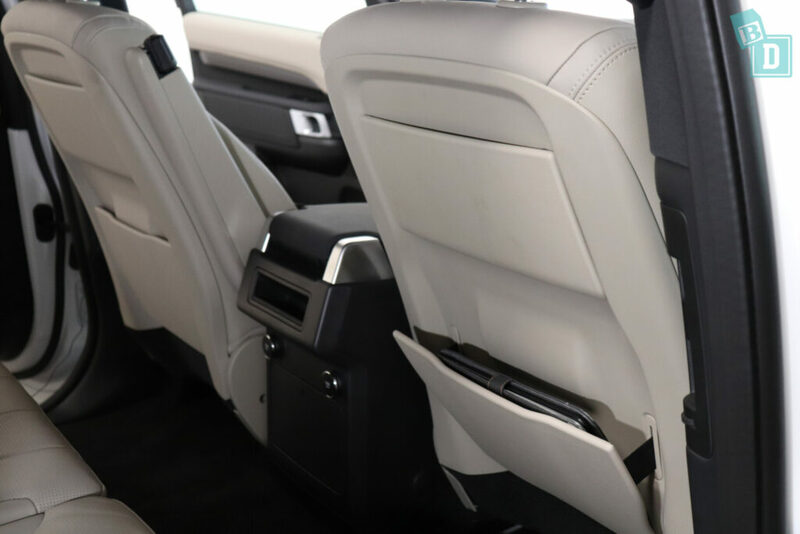 The Discovery is one of the few seven-seaters that has top tether anchorages for all rear seats, this is excellent!! In the third row, they are on the seat backs and within plastic guides, I found them easy to connect to and accessible through the boot. In the second row, the two outer anchorages are within plastic guides and I found them easy to reach and connect to. The central top tether anchorage is not within a plastic guide and is lower down on the seat back, so a little trickier to reach. 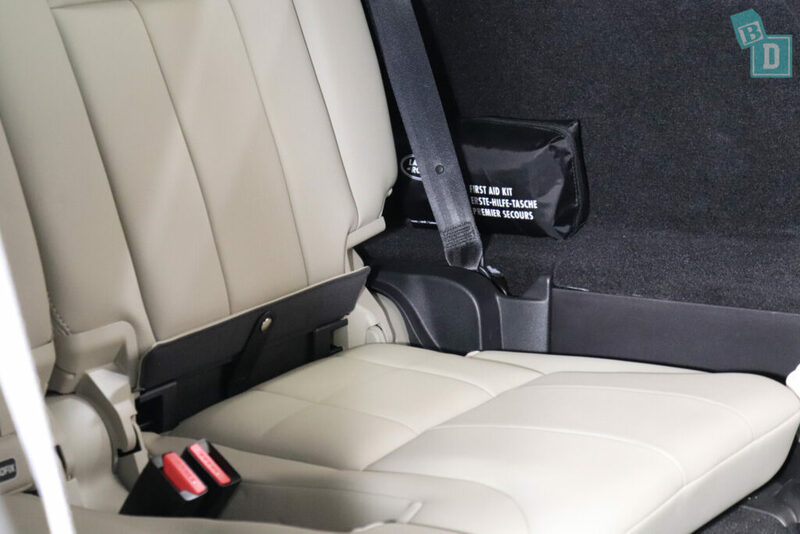 The good news continues to the ISOFix… there are FOUR sets of ISOFix points in the Discovery!! Two in the second-row in the outer seats and two in the third-row too! It is really refreshing to find so many ISOFix and top tether anchorages in a seven-seater making it an excellent BabyDrive! 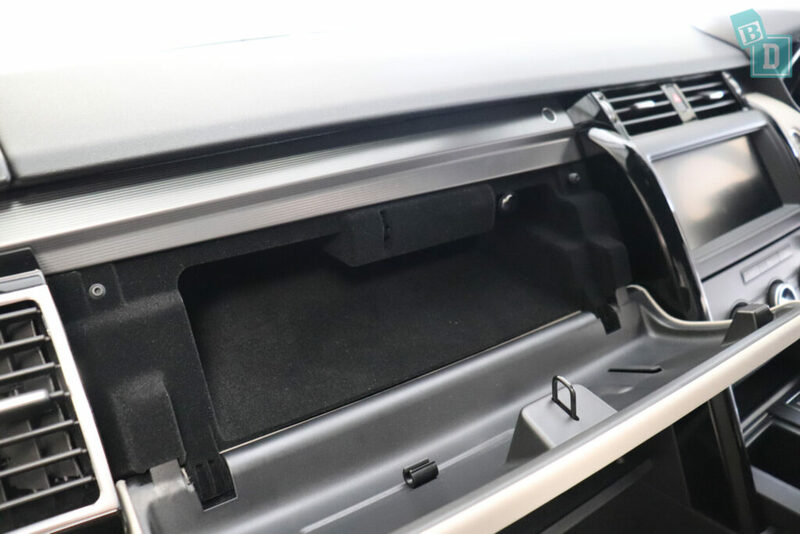 The ISOFix are within plastic guides, behind a flap of the seat leather and I discovered a small but fantastic little strip of plastic that holds the flap up while you are fastening the child seat into place and while it is installed. I imagine this also prevents that piece of upholstery leather getting damaged by the child seats squashing it. It is a very small detail but made a huge difference. So, how many child seats could I fit in the Land Rover Discovery? Five!! Two forward facing fitted nicely in the third-row seats. And three fitted across the second-row seats. I did try three forward facing and they fit nicely as well. I also found with the central child seat removed I could sit comfortably between the two child seats and I am 162cm. I found accessing the third-row seats you would have to uninstall a child seat from the second-row outer seat because there is not enough room to bring the seat forward and climb through with it in place. Also if you have three child seats across the second-row the child seats hit against each other preventing you from bringing the seat forward. 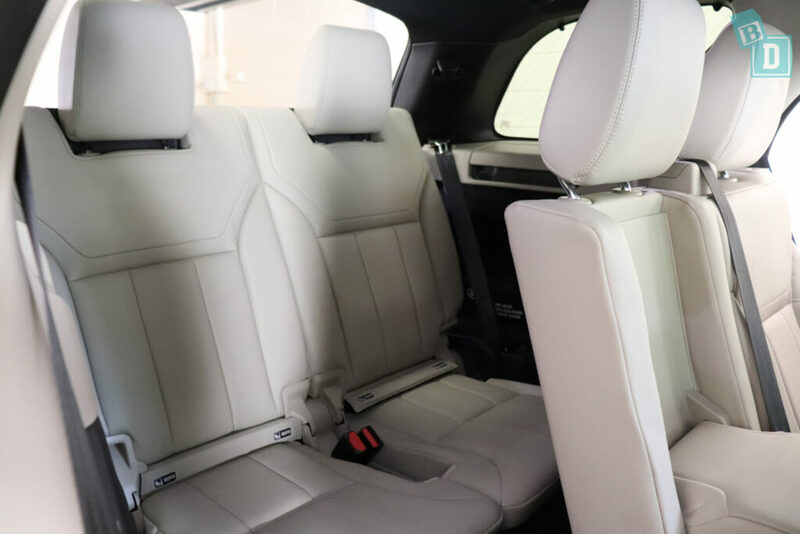 We found when using all three rows, legroom was quite tight with a rear-facing child seat installed but a 182cm driver could sit infront of it with a 162cm passenger in the third row. Posting bub into their seats from outside the car is good for forward-facing and rear-facing child seats. 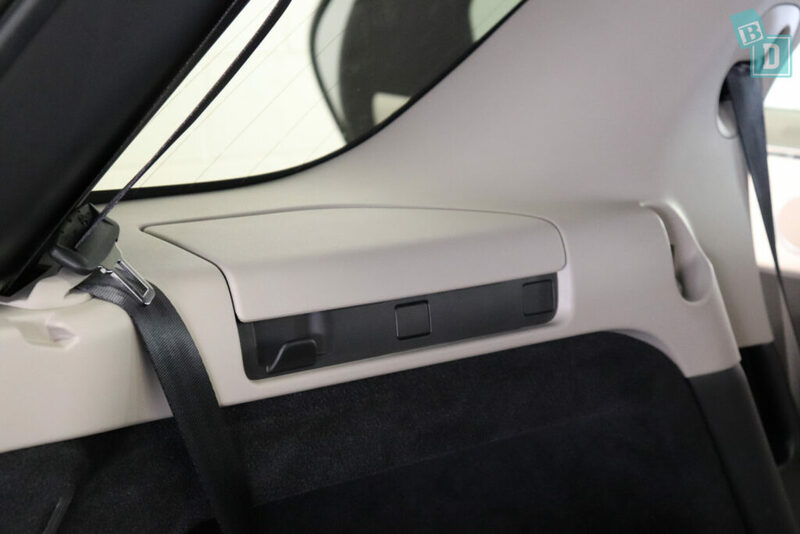 The door opening is a big open shape allowing you space to post them in and you can set the height of the vehicle so you are not bending down or up too high as well. Doing this from inside I didn't find as easy as I felt the roof was low in the Discovery, so there wasn't as much internal space. With only one child seat installed in the second row, there is plenty of room for feeding bub in the back. 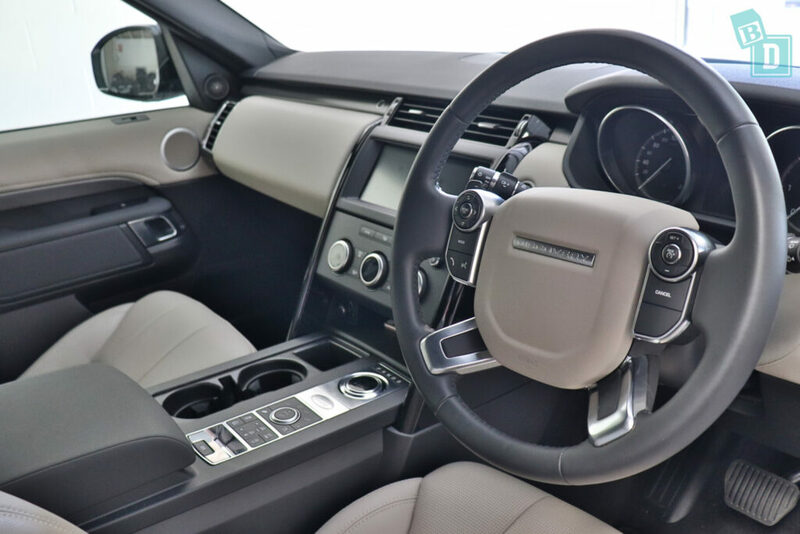 The Land Rover Discovery SE was upholstered with cream leather, it TERRIFIES me!!! I have a toddler with a car travel sultana habit and I know the damage those things can do to dark seat coverings let alone cream!! The seats also had perforated panels through the centre of them for heating and collecting every little crumb my daughter dropped!! I am told the model I tested had a ‘black kit' on it, giving it black trims on the outside and the ceiling on the inside. I would be tempted to swap the dark interior coverings to the seats and door panels and the cream to the ceiling just to save myself the stress! Kid spills aside, I was not a fan of the dark ceiling, I found it quite oppressive because the roof is low anyway so it adds to that. 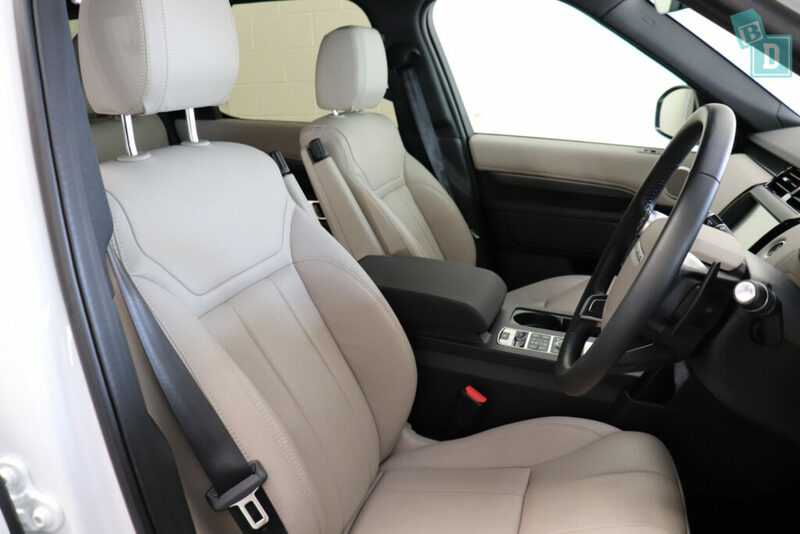 I also didn't find the front seats of the Land Rover Discovery SE very comfortable, they have electric adjustments on the side of them and I didn't find a comfortable position at all. They didn't feel supportive in any way and they sit so high that at 162cm I had to sit really close to the pedals in order to reach them and then it felt like my feet were pressing on top of the pedals a bit like when driving a van. I couldn't wear a ponytail either with the shape of the headrests. The second and third-row seats are much more comfortable, in fact, the third-row seats are some of the better third-row seats I've tested. They have proper depth in their bases so you are not sitting with your knees around your ears and good kick room underneath the second-row seats. Our 182cm tester found them very comfortable too. The steering wheel is fully adjustable in/out and up/down, which is good because having to sit so close in order to reach the pedals, meant I needed to push the steering wheel as far away as possible. 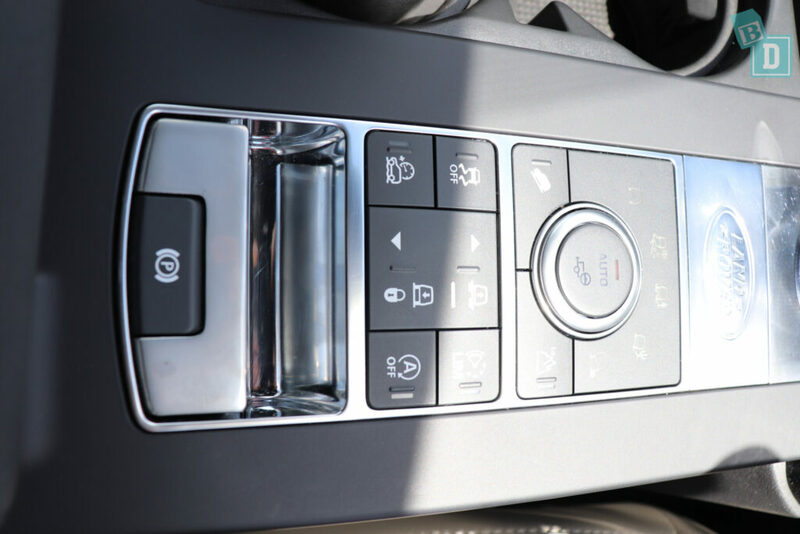 The cruise control buttons are on the right-hand side of the steering wheel, they are simple to use but I was disco-pointed with the cruise control accuracy. I was not too bad on straighter motorway roads at high speeds but on undulations and at lower speeds, it really raced away with itself up to 10km/h over and under the set speed! The digital display in front of the steering wheel has the distance to empty for the fuel, which I find fantastic and wouldn’t want to be without! The distance to empty display becomes extra important as a mum because getting fuel with a baby is a whole new world of difficult. If they are screaming in the car you definitely do not want your journey prolonged with a fuel stop! If they are asleep the turning off of the engine, doors opening and locking and unlocking, then re-opening the doors and closing, starting the engine again, beepers going off because you haven’t got your seatbelt on when you start the car or because you blink in the wrong direction, do you take them out of the car when you go in to pay? If you do will you get them back in the seat again or will they have a complete meltdown and you’ll be stuck on the fuel station forecourt with a screaming baby!! Hopefully you are starting to gather the anxiety that what was once a simple fuel stop can be for a mum!!!! For this reason the distance to empty display can let you know if you have enough fuel to make it home with bub and then go out and get fuel another time when you will not have to take bub with you. 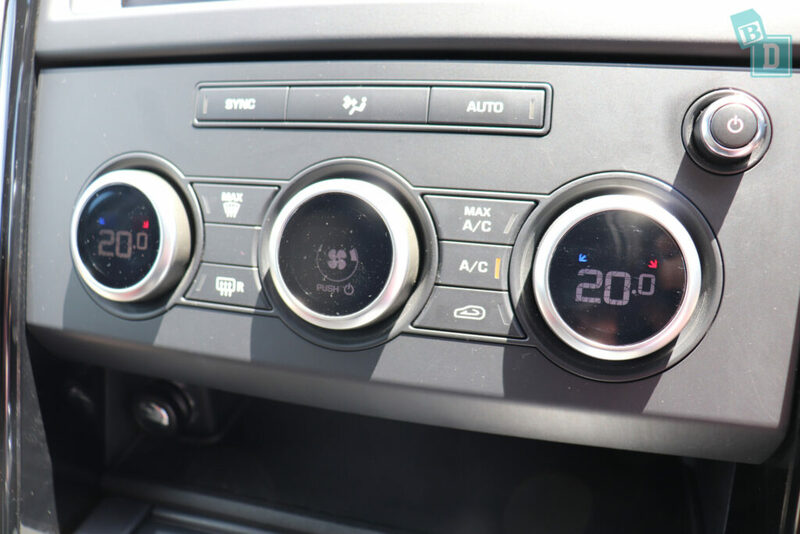 There are four air-con vents across the front dashboard; two in the centre above the media screen and one at either end. 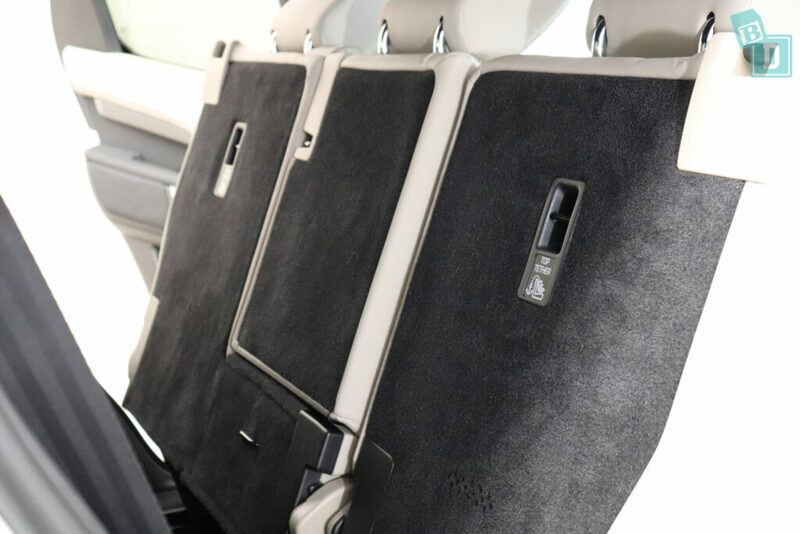 For the second-row passengers, there are two air vents, one in each of the side pillars. I LOVE these type of air vents in the back because they allow a subtle airflow throughout the rear without blowing down on to little passengers heads. There were no third-row air vents in the model I tested but I think you would need them in the summer. 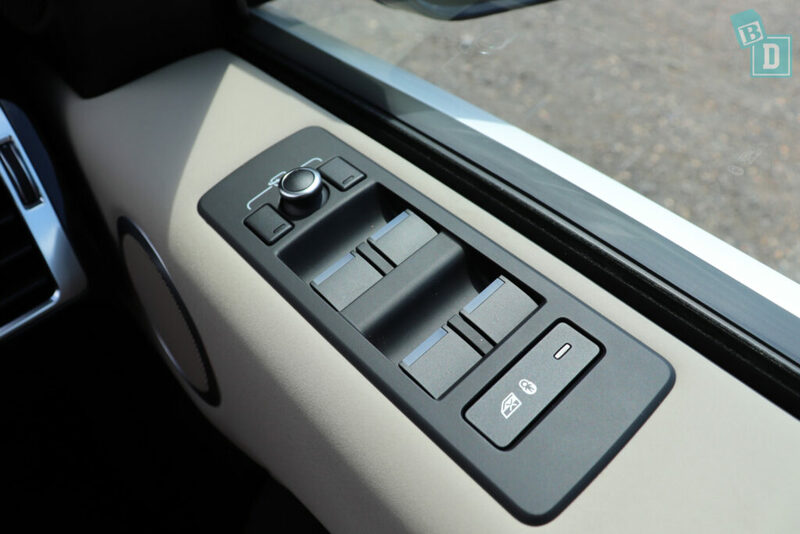 The air-con controls are situated below the media screen, they are nice and simple, easy to use and I am told by the Land Rover salesman that in the higher spec models you have third-row airvents and you can control the rear aircon from the same control panel in the front. I found once you had five child seats installed in the back of the Discovery that visibility was minimal out of the back window, so you really need to use your reversing camera. 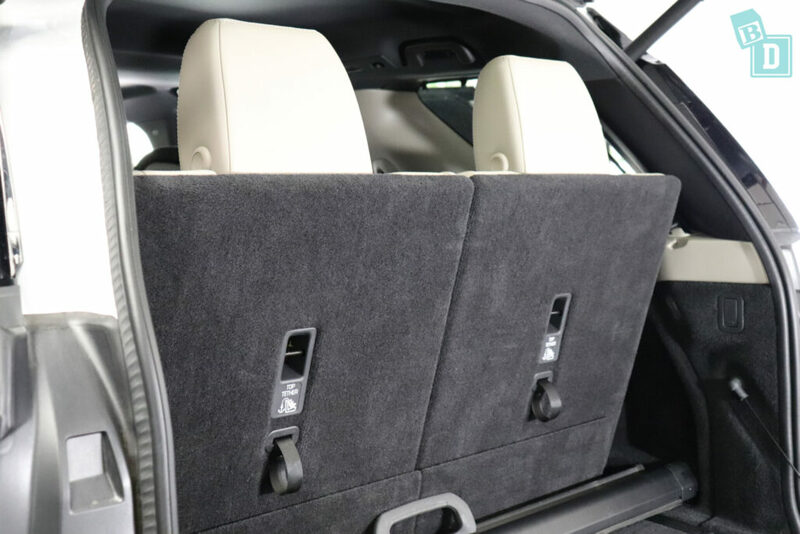 If you are only using the two outer second-row seats you can fold forward the headrest in the central seats so you get a better view out of the rear windscreen. I also found the high seating position and low ceiling meant I was almost ducking my head to see out of the front windscreen. 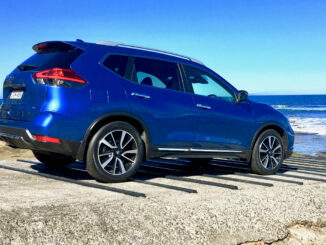 In contrast, the rear side windows allow a good view for the driver to see out of when you are changing lanes even with rear-facing child seats installed. The Discovery is a big vehicle but I didn't find it too bad to maneuver and park. The camera image quality is fantastic so that definitely helps. 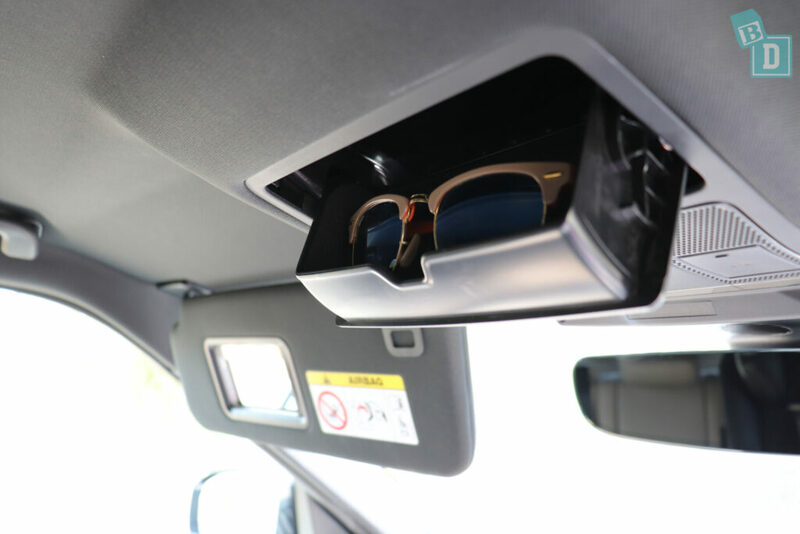 Visibility when parking is definitely impaired by the rear windscreen not being able to be seen out when headrests are up and child seats are installed, so you really do have to rely on the rear camera. One thing I have noticed since being a mum is I hate it when I reach a destination or get home from being out and Tulsi has either done really well in the car or she is screaming her head off and I have done really well to keep it together for the entire journey (usually the latter!!) and it takes 10 minutes to park the car! It can be really stressful. Usually I dread when we get big SUVs or Utes as they take longer in our tight apartment block carpark, the Discovery, quite a large SUV was not too tricky to reverse park due to the camera quality! For rear-facing passengers in the back, the view out of the windows is good because they are quite large and the seating position in high. The interior lights in the front are touch sensitive on lights, in the second they are centrally located in the ceiling, I could not reach them while driving. In the third row, they are next to the grab handles above the windws. I found I could turn the rear lights on using the button in the front ceiling but I struggled to turn them on myself when sitting in the back. I got quite lost on a weekend drive in the Hinterland and ended up exploring some dirt roads for a while and I was really surprised at how good the Discovery drove in those conditions. I felt really confident in it and it showed a whole new side to the Toorak Tractor, so if all you ever do is school drop-offs you are missing out!! 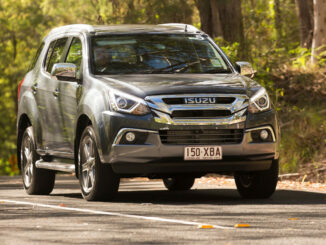 Take it out to the bush at the weekend and have a bit of fun!!! Around town it felt unnecessarily big for my needs, however, I didn't struggle when parking in a supermarket or daycare tight carparks. There are handles in the ceiling above both rear doors and in the third row, they are useful for hanging a baby toy from. I did find they were slightly too far forward and that the toy hung more on bubs head rather than in front of them when you had a tall passenger in the seat in front. 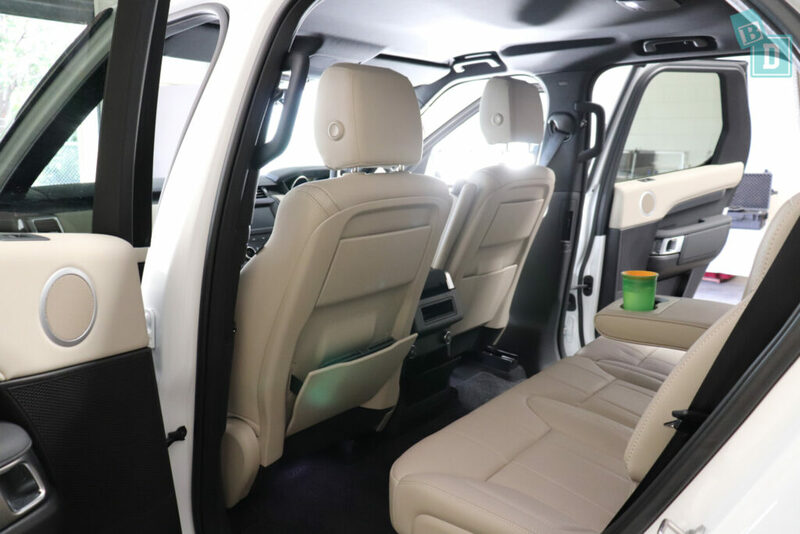 The interior of the Discovery SE is beautiful but cream leather upholstery on the seats and the door panelling is completely impractical! If I had a dollar for each time I said “take your feet off the back of the chair this is mummy's work car” I would be a very wealthy woman!! The SE model I tested is about mid-range. The interior felt opulent, stylish and quite special. It is definitely an interior you would want to take good care of! I had one little gripe about the central console and gear dial surround being silver, I found the sun reflected really badly off the silver metal panel and I had to drive with either my hand over it or my scarf! 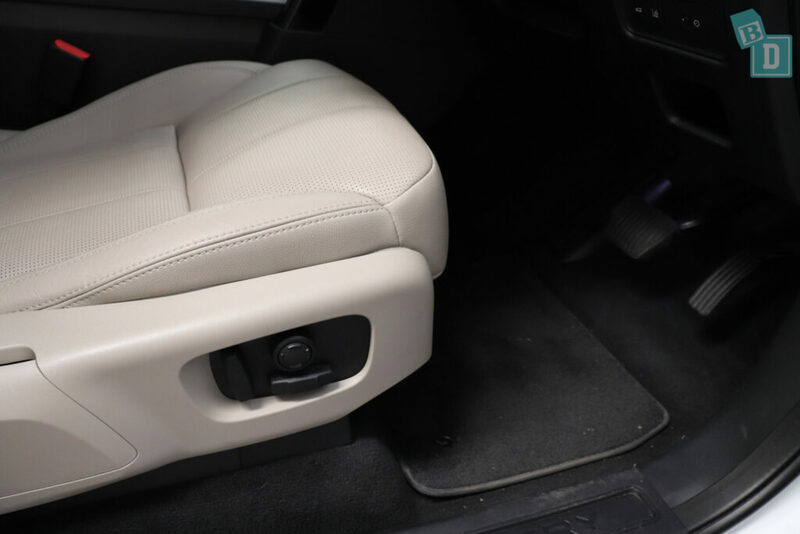 There are simple carpet floor mats throughout the Discovery. The Discovery did not have keyless entry which was disco-pointing for a car of this price. The tailgate opens and closes silently so it doesn't wake any little passengers. The Land Rover Discovery has a five-star ANCAP safety rating in 2017. 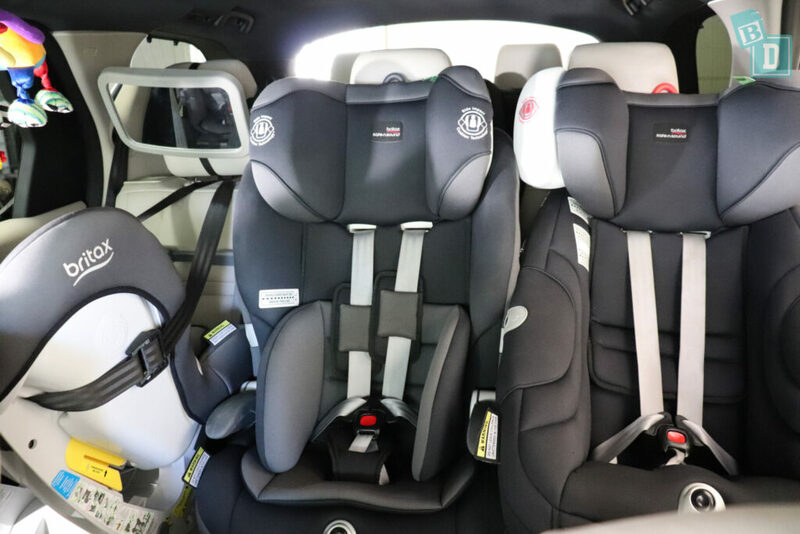 In testing it scored 80% for child occupancy protection (39.5 out of 49), 90% for adult occupancy protection (34.3 out of 38), 73% for safety assist technology (8.8 out of 12) and 75% for pedestrian protection (31.7 out of 42). 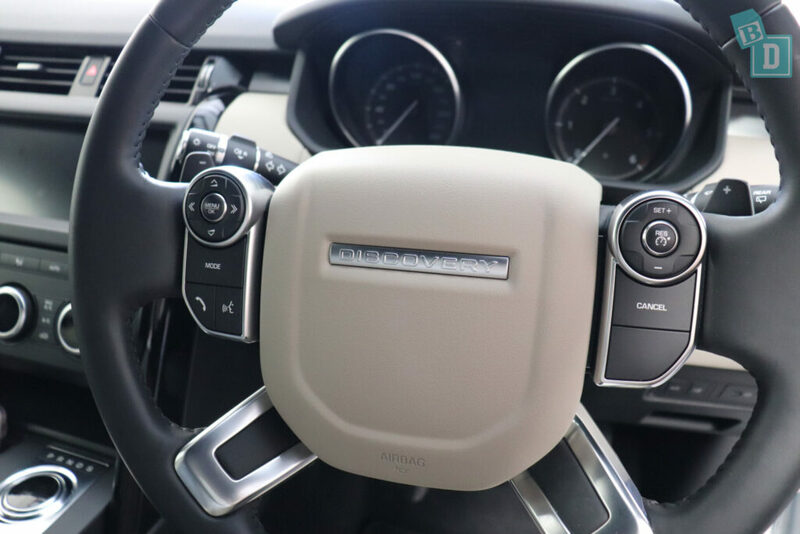 The Land Rover Discovery has six airbags as standard. 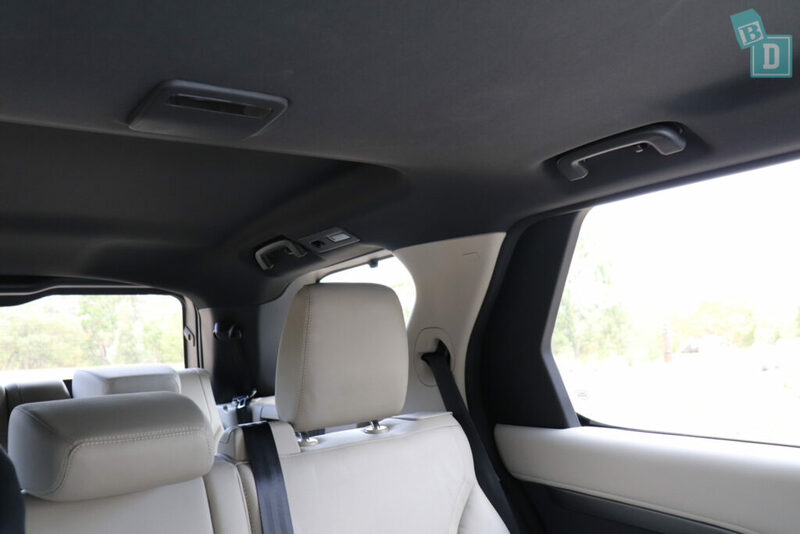 Both front passengers get front and side chest airbags and side head curtain airbags extend to all three rows of passengers. As standard, the Land Rover Discovery comes with seatbelt pre-tensioners in all three rows of seats, anti-lock brakes (ABS), autonomous emergency braking (AEB) for city, interurban and vulnerable road user, electronic brake force distribution (EBD), electronic stability control (ESC), emergency brake assist (EBA) and emergency stop signal (ESS), lane departure warning (LDW), daytime running lights (DRL), hill launch assist, reversing collision avoidance, roll stability system and speed assistance – manual speed limiting. 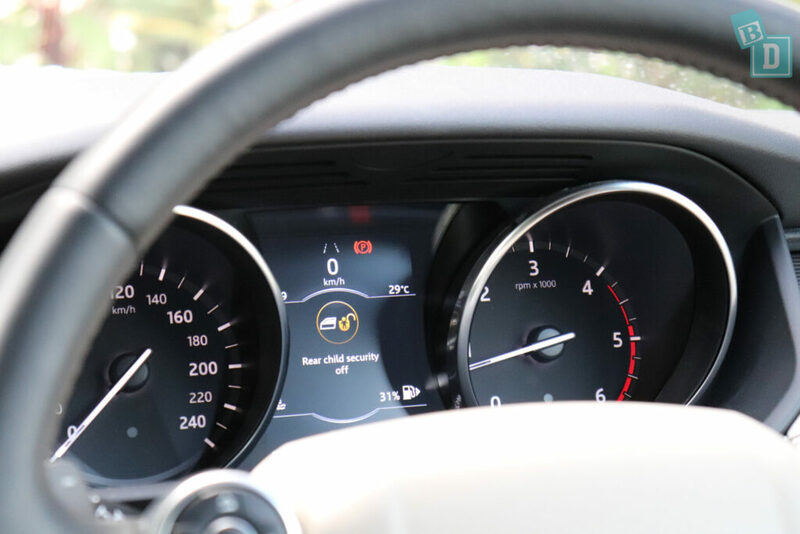 Options on the base variants are tyre pressure monitoring system (TPMS), lane keep assist (LKA), automatic headlights, automatic high beam, blind spot monitoring (BSM) and adaptive cruise control (ACC). Some of these safety features are also features that drive me crazy as a mum! Like the lane departure and the parking sensor beeping sound. I want all the safety technology AND to be able to mute the sound when my daughter's asleep!